As current Chicago Mayor Rahm Emanuel is set to leave, voters are beginning to voice their concerns about what is going on in their city. Pastor Michael Allen oversees Uptown Church in Chicago. He’s also the co-founder of Together Chicago, a nonprofit group that is working to bring about major changes to the windy city. At the top of the list of concerns for Believers in Chicago is the issue of violent crime. “Gun violence in the city of Chicago continues to plague our city,” Allen said in an interview with CBN News. He went on to say that the issue of broken families is also a big problem. “I believe that broken families lead to a lot of the crime and poverty that we see in our city,” he said, noting that Christian voter turnout will be critical as the city looks to elect a new leader. “We believe that if the Church really does come together around the values that we hold near and dear to our hearts and choose the candidate that best upholds those values or align with those values, we’re going to see a major change in the political scene here in Chicago,” said Allen. Allen said the city needs a leader who understands the root of the problems facing the Windy City. Allen believes movements of prayer followed by action are paving the way to true change in the city. “For the last five years, God has raised up a movement of prayer in the city that has historically been so segregated in so many ways and separated by race and class and geography and denomination, and it’s a movement started called Pray Chicago, which is now Chicagoland United in Prayer, and that’s underneath the banner of Together Chicago,” explained Allen. 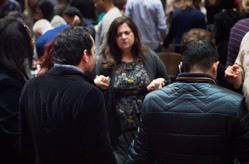 “And so, we’re seeing God bring people from the north side, the south side, the west side, as well as from various ethnic groups, socio-economic groups and denominational groups to cross those boundaries, to set aside those labels and to come together as one Body of Christ to pray together,” he continued. The mayoral election takes place Feb. 26.